Sometimes it’s easy to hate the French. The food. The wine. The beautiful women. We’re not quite sure what the country has done to deserve all this mana from heaven, but they must have all been very well-behaved in a past life. And, as if to rub salt into the wounds of the rest of the word, along comes the very attractive Monsieur Fabrice Rude from La Manufacture. With a name that couldn’t be more French if it tried, he’s here as living proof that life is just plain better in the land of the Française. 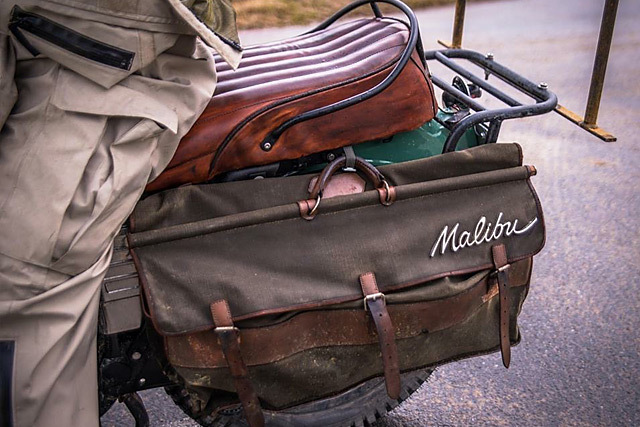 Deciding he just might pop along to the Wheels & Waves show in Biarritz, he seemingly threw together a build at the last-minute only to become the star of the show and subsequently smothered in beautiful women, fame, fortune and bucketloads of la belle vie. Don’t you just hate him? The R100RS had a nice patina, a 320,000 km (!) engine, and was very well taken care of by its first owner. Since being purchased by Fabrice, she had been mostly used for commuting to work and back,which was a 100 km round trip. “I decided to get her a new paint job – something that I had in mind for months and months. 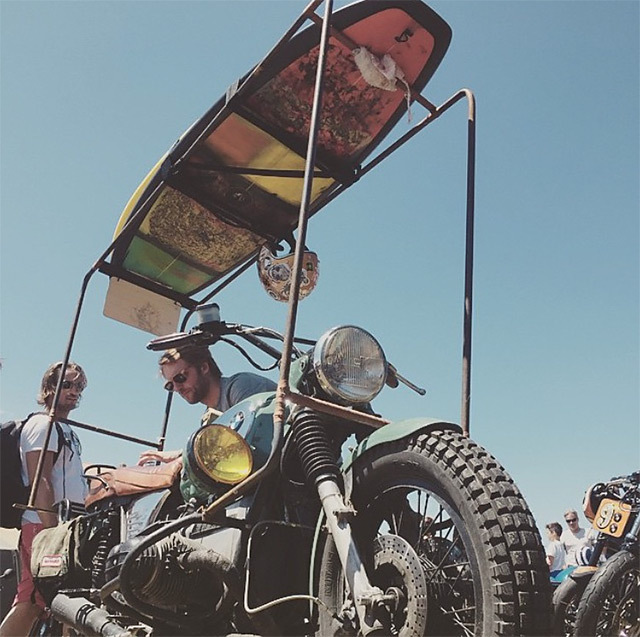 Apart from the obvious, that would be my only Wheels and Waves touch.” As an aside, Fabrice adds that during his first Wheels and Waves, he was far more concerned about the surf than the bikes. Yes, he is a surfer. Who would’ve thunk it? An his big idea for the show? 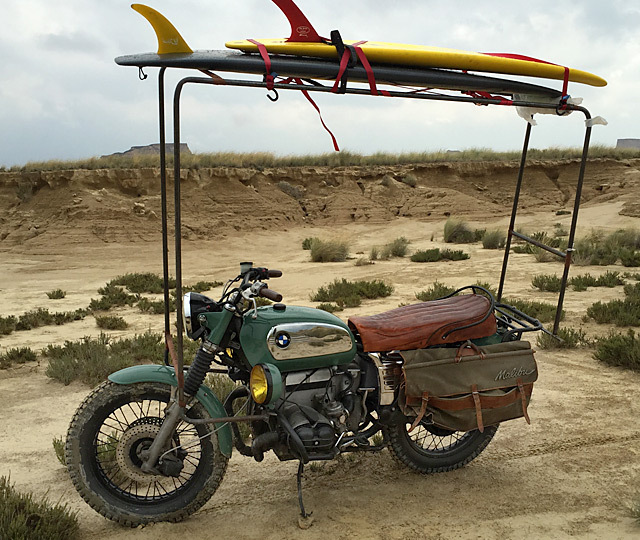 “I decided to make something useful – something that could take me around Biarritz with my two surfboards and still allow me to ride straight from the beach to the event and back.” So in his spare time, he got to work and drew up a plan for the rack to beat all racks. After three solid hours of bending tubes he’d found at his friend’s junkyard, he had one perfectly rusty rack, welded and neatly fitted to the bike. “It was really intended to be used, not just showcased, and it did the job perfectly. But only in the city and on slower roads, of course. I’ve never tried it at more than 60 or 70 km/h.” Best keep it that way, we think. So with everything sorted and a good three days to relax before the event, Fabrice’s friend, photographer Gotz Goppert, asked him if he would come to a shoot for a French clothing brand. They needed bikes and were scheduling a session in the Bardenas Desert, in Spain. “We brought a customer’s bike along with mine and we both took off. It was a fun time, meeting the label’s crew and shooting for their big new campaign.” We’re guessing the models wouldn’t have hurt, either. 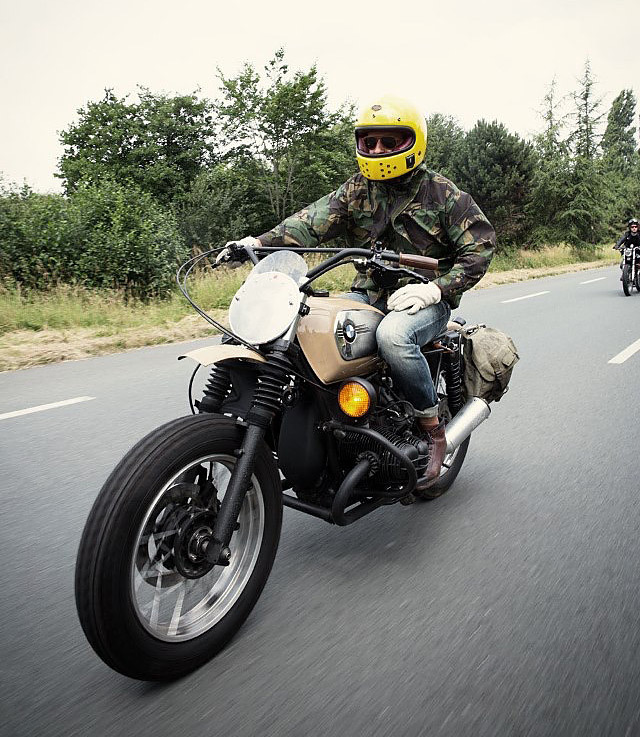 With the fun done and dusted, Fabrice then headed off to the Wheels and Waves event for more, um, fun. “It was a blast, even with the rain pouring down for 2 straight days. 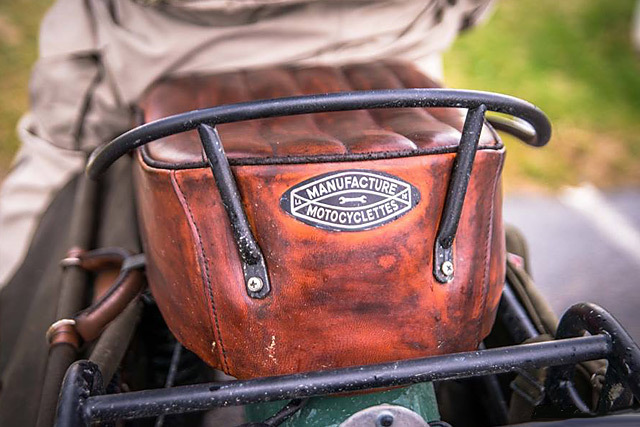 Ironically, the rack turned out to be quite a nice shelter from the wet weather, and an eye catcher for sure.” Enough of an eye-catcher, in fact, that we shared the bike, builder unknown, on our Facebook page. Not only was the response overwhelming, but we were lucky enough to get in touch with the man himself. Little does he know that we’re planning on staying at his place for Wheels & Wave 2016. He best stock up on French food, wine and attractive models while he still has the chance. 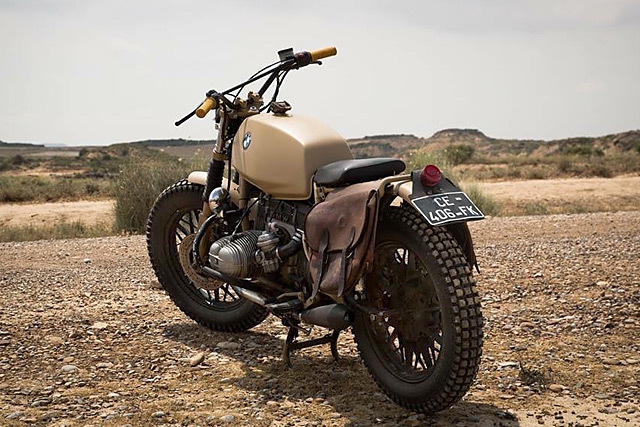 The R100 was joined in the desert by another of Fabrice’s builds. Talent, much?